Recent rainfall across Los Padres National Forest has led to rising fuel moisture levels, prompting officials to reduce fire restrictions on the forest effective immediately. Under the reduced fire restrictions, campfires and charcoal barbeques will be allowed in all areas of Los Padres National Forest. A California Campfire Permit, available free of charge on the Forest website, is required to build a campfire outside of a designated Campfire Use Site. 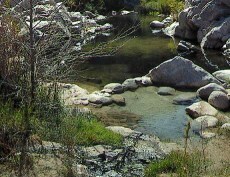 A list of Campfire Use Sites and information about how to acquire a campfire permit is available on the Los Padres National Forest website: http://www.fs.usda.gov/lpnf and at all forest offices. Visitors who construct wood or charcoal fires outside of designated Campfire Use Sites also must clear all flammable material for a minimum of ten feet in all directions; have a shovel available for preparing and extinguishing the fire; have a responsible person in attendance at all times; and extinguish the fire with water, using the “drown, stir and feel” method. Prohibitions on smoking and target shooting in Los Padres National Forest are also being lifted. Under these lower fire restrictions, the Forest will begin disposing of accumulated fuels by burning brush piles at administrative sites within national forest lands. These sites include: developed and undeveloped campgrounds, ranger stations, fire stations, guard stations, lookouts, electronic sites, special permit sites, and miscellaneous piles along Forest Service administrative roads. These projects will occur when weather conditions and air quality are favorable to safely reduce these fuels. Fireworks are prohibited in Los Padres National Forest at all times and in all places. Visitors are encouraged to call the local Ranger Station for more information on conditions and restrictions.